Home / Archive Category: "Press Release / "
PRESS RELEASE – The Saint Lucia Sculpture Park (SLSP), a foundation established to design and develop a national sculpture park, utilising the entire island of Saint Lucia, hosted a press launch of one of its first projects entitled “Beautiful Gardens of Saint Lucia”. This event was hosted at the Royal by Rex Resorts on November 20, 2014 and the featured speaker was Agriculture Minister, Moses Jn. Baptiste. 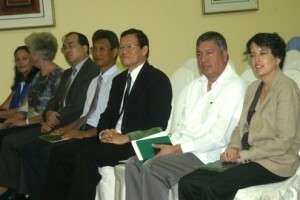 Attendees present were Members of the Diplomatic Corps – Taiwanese Ambassador, James C.P. Chang; First Secretary to the Taiwanese Ambassador, Louis K.H. Liou; Mexican Ambassador – Luis Manuel Lopez Moreno; representatives of the French Embassy Madame Billet and Madame de la Moussaye; a representative of the Saint Lucia Solid Waste Management Authority, Dunley Auguste; Saint Lucia’s Tourism Director, Louis Lewis; representatives of various Credit Unions; Agricultural Extension Officers; Farmers and Anthony Bonaparte, Dean of the Division of Agriculture. Also present at the press launch were the consultants and members of the board of directors. The Agriculture Minister emphasized the need to beautify small, medium or large spaces to create an environment with aesthetic qualities which every generation of Saint Lucians will enjoy and appreciate. “Beautiful Gardens of Saint Lucia” is an island wide environmental and beautification competition in 75 to 100 categories, with three prizes in each category and will be a three year campaign with an monetary prize of EC$350,000.00 each year for the most beautiful garden and an overall monetary prize after three years of EC$1 million, in preparation for the sculpture park project. The details of a series of competitions such as essay and poster competitions for schools, island wide jingle competition and photography competitions will soon be unveiled. 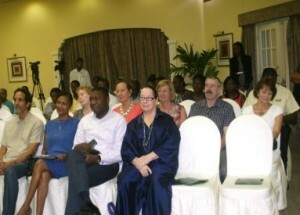 President and founder of the Saint Lucia Sculpture Park, and the Board Members would like to express their gratitude to Mr. Richard Michelin and the staff of the Royal by Rex Resorts for making this event possible. Saint Lucia Sculpture Park mission statement is to act as a catalyst to heighten aesthetic an creative awareness and add dimensionally to Saint Lucia’s folkloric heritage.